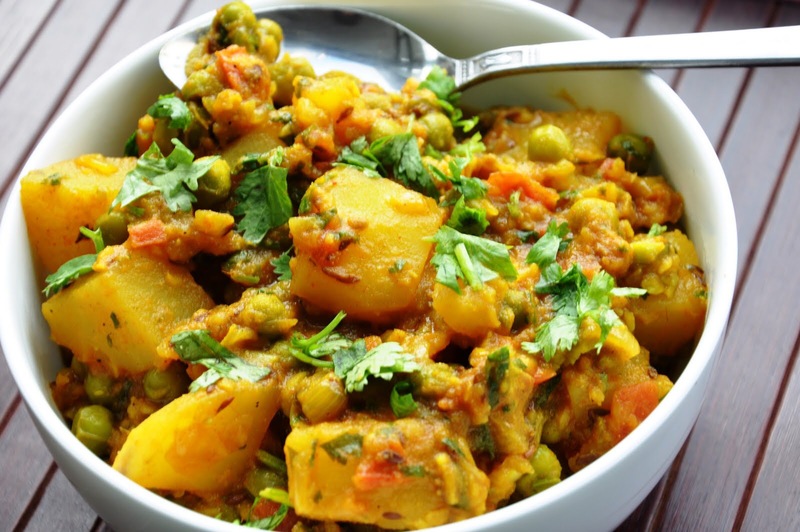 This is a classic Punjabi recipe and my granddad’s favourite dish. It’s very easy to make and I’d definitely call this comfort food. In a non-stick pan use 1 teaspoon of oil. When hot add jeera. When jeera sizzles, add onions and lightly brown them. Add tomatoes, purée, ginger, garlic and cook for about five minutes. Add a little bit of water if you think it’s too thick. Add your masalas, followed by the methi (if using), coriander, potatoes & peas. Add a little water and cook until potatoes are done and the water from the masala has dried up. *Goes well with yellow or green daal with garam roti! * Some people even add carrots to this sabzi. You can cut 2 small carrots into cubes and add with the potatoes and peas. This looks so yummy – and I would love to try and make it! But I’m scandinavian and I do not know what Methi or Jeera is? Is there other names for it or maybe substitutes that will work? Your blog looks very nice! Are you adding the potatoes completely raw? Like – that takes a while to cook right? Yes, completely raw hence the water to stop the masala from going really brown and burning. Also that’s the reason why they’re cut into smallish cubes. For a quick and easy way to make this dish, you could parboil the potatoes. That way they’ll cook faster. Do you have any suggestions for dishes I should try out? I saw it on your blog! Loved your signature to the dish. Isn’t it such a yummy dish? Try it with naan bread or plain rice. Delicious! Best way to eat vegetables !! Hey, can i replace the methi with fenugreek powder instead? The fine one and in what quantities? Hi! If you are to use one teaspoon of the dried leaves, replace with half a teaspoon of the powder. Fenugreek is quite a strong flavour, even when you use the fresh methi. It complements the other masalas really well and gives a bit of a kick to the flavour. You’ll always be asked what’s your secret ingredient – it’s the methi!